In the past number of years the ADA has been further inspecting corporations that do not appear to follow their sign regulation guidelines. Make sure your company is not at an increased risk of being hit with a major fine for failing to comply with official ADA guidelines. 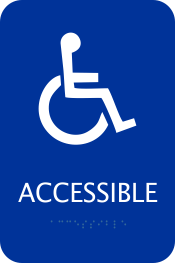 ADA signs are 100% informed with all the latest ADA regulations currently adhered to by the state administration. This sign has rounded corners with an adhesive backing and measures 6 x 9". ADA Sign Vertical 24" x 10"
ADA Sign Vertical 20" x 1"
Laser Pocket Badge - 1.5" x 3"
Be sure that your offices able to be found by clients. Whether your offices are brand-new or older, it is always a good idea to make sure that your business is keeping with ADA rules and regulations in relation to your office signs. This sign has rounded corners with an adhesive backing and measures 6 x 9".